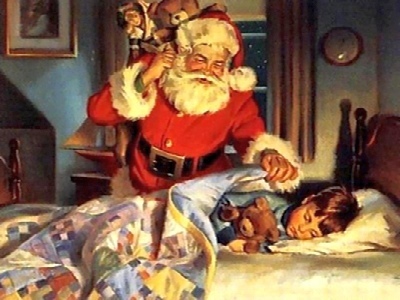 as now often taught by adults to their children, is a jolly, white-bearded overweight fellow in a red suit who just loves to give away gifts on Christmas eve unconditionally. It’s sad because it has been used to turn Santa into every commercial establishment’s favorite Christmas mascot, a grossly exaggerated caricature of a real Christian saint who devoted his life to the service of others. Now, if you want to give your children a less materialistic take on what Santa and Christmas are all about, why not take a look at this brand new book : Santa Claus, Gift of a Servant. Released off the press just this October 1st, it is the fictional tale of a father who blames Santa for the holiday hysteria that has taken over Christmas. He blames Santa and decides to wait up for him on Christmas Eve to demand his resignation. When Santa comes, however, he gives Dad an unexpected gift: a glimpse into the heart of his mission to bring “gifts of love from Heaven above” to God’s children, reminding them that Christmas is about sharing the love of Christ. Written in verse in a style that calls to mind the classic “Twas the Night Before Christmas” poem, it makes for excellent bedtime reading to children under 7 years old.